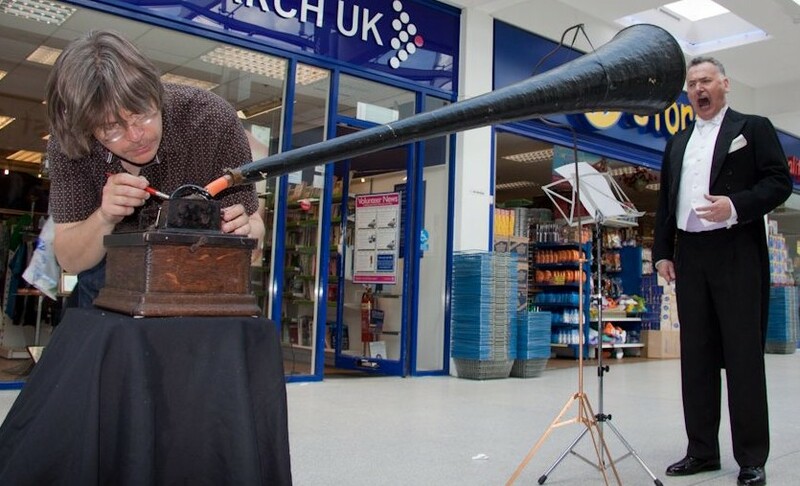 In his role as the Science Museum’s sound artist-in-residence, Aleks Kolkowski will demonstrate the art of sound recording onto wax cylinders using a hand-cranked Edison phonograph in a new series of regular live recording sessions that are open to the public. Each session takes place in his studio and features a guest musician, artist or writer who records ‘acoustically’ by speaking or playing sounds into a horn, without the aid of electricity. The process of inscribing grooves and acoustic sound recording is explained and the work of the invited artist is introduced. The finished wax cylinders are finally reproduced using giant antique brass concert horn. Free entry but places are limited, please book via the Science Museum’s website. The studio is located on the Ist Floor of the museum opposite the Foucault pendulum staircase between the “Materials” & “Agriculture” galleries. Jason Singh is a beatboxer and vocal sculptor whose work is rooted in inspiring people to engage in exciting creative experiences. Using his voice and a range of samplers and loop pedals, he can vocally recreate sound and music compositions mimicking a wide range of instruments, textures, wildlife, and abstract experimental sonic environments. Jason will create a live improvised piece incorporating beatboxing and vocal sculpting techniques. Mick will read a short passage from The Underground Man, which is a first person narrative, written from the point of view of an eccentric Victorian aristocrat. Mick Jackson writes fiction and screenplays. His first novel, The Underground Man, was shortlisted for The Booker Prize and won The Royal Society of Authors’ First Novel Award. Cheryl Tipp‘s research interests include the history of wildlife sound recording, early commercial wildlife recordings from the gramophone era, bird and animal imitators and music hall acts with an emphasis on whistlers and animal imitators. She is a Committee member of the International Bioacoustics Council (IBAC). Cheryl will read from her writings on recordings of birdsong, accompanied by wildlife sounds on 78rpm records played on a gramophone. Nahum Mantra is a composer, curator and thereminist based in Mexico City. He plays with Orchestra Elastique and curates Kosmica, the space-themed series for The Arts Catalyst. Nahum has recently been appointed as the co-ordinator of the Technical Committee for the Cultural Utilisations of Space inside the International Astronautical Federation in Paris. He will improvise on the theremin and also talk about the history of the instrument.